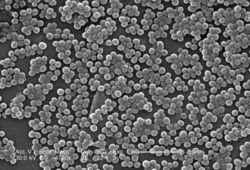 Methicillin-resistant Staphylococcus aureus (MRSA) is a bacteria that is commonly found in nasal passages and skin of humans and multiple animals. Methicillin-resistant Staphylococcus aureus is resistant to beta-lactam antibiotics and in some cases to other antibiotics. Although MRSA is primarily found in people, animals can also be infected. Can my pet get MRSA? MRSA has been recovered from animals including horses, dogs, cats, cows, and pigs. Some of these animals have not been exposed to antibiotic therapy and in several of these cases the MRSA infection appears to result from human-to-animal transfer. Direct skin-to-skin contact is the most common way MRSA is transmitted, but it can also be transmitted by contaminated objects and surfaces. In humans, MRSA infections occur most frequently among persons in hospitals and healthcare facilities who have weakened immune systems. Yes, people and pets can carry MRSA on their skin or in their nose and have no outward signs of illness. This is called colonization. National data suggest that approximately 2.5 million healthy people in the United States are carriers. Encounters with carriers usually do not result in infection and clinical illness. MRSA most commonly causes skin or wound infections. Symptoms of a MRSA infection depend on where the infection is located. Infections of the skin are the most common, and cause symptoms such as redness, warmth, pus and a wound that does not heal. Your doctor may refer to these infections as boils, furuncles, impetigo, or abscesses. Infections can also develop in the blood, bone, bladder, lungs, and other sites. Other symptoms may be fever and pain at the site of the infection. A swab taken from the affected area is submitted to a laboratory for bacterial culture. Treatment varies from case to case. If the person or pet is colonized, no treatment may be needed. Localized skin infections may be treated with topical cleaning agents and antibiotic ointments. More serious infections are treated with oral antibiotics. Where can I get more information about MRSA? More information about MRSA is available on the Virginia Department of Health website at http://www.vdh.virginia.gov/epidemiology/epidemiology-fact-sheets/methicillin-resistant-staphylococcus-aureus-mrsa/ or through the Centers for Disease Control and Prevention website at https://www.cdc.gov/mrsa/index.html.